Perry, the corgi mix, approves of layering rugs and throws to create an inviting entry. 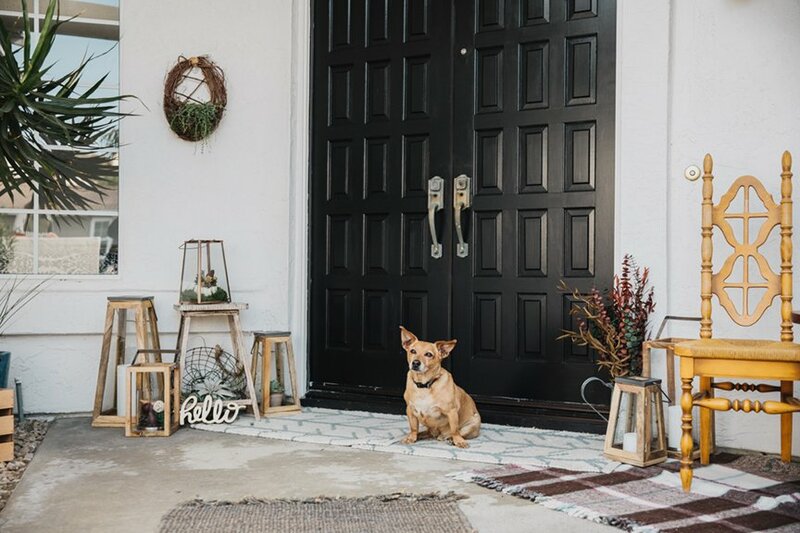 Your front entrance—whether a humble stoop or a sizable courtyard—is your home’s first impression. 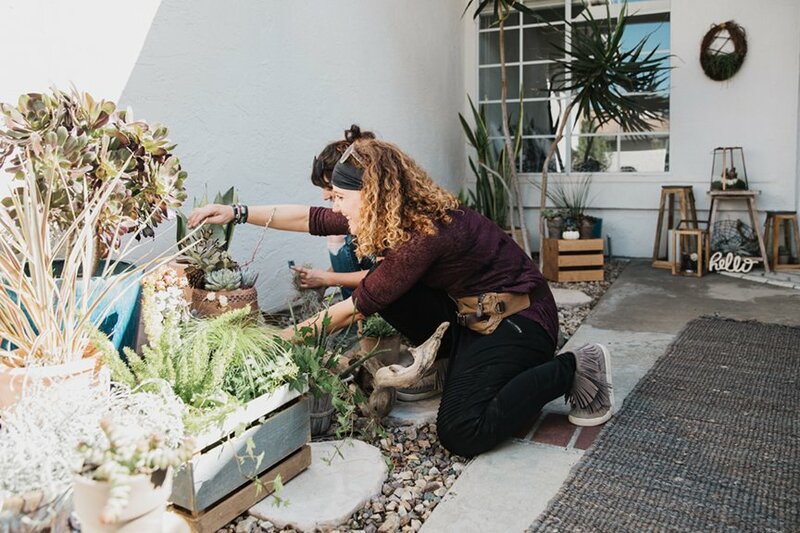 It’s also an easy way to increase your home’s livable space in San Diego’s mild climate, says Rachael Cohen, who owns Infinite Succulent, a plant art and styling service, and is the author of the soon-to-be-released book (due early 2019) of the same name. “Why stop at the interior of your home,” she says. 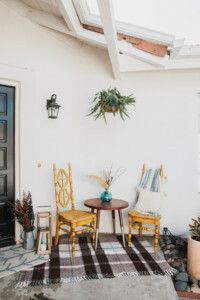 Rachael’s responsible for the three different looks in this front courtyard, each of which show how easy it can be to up your home’s curb appeal and change things should your style shift. 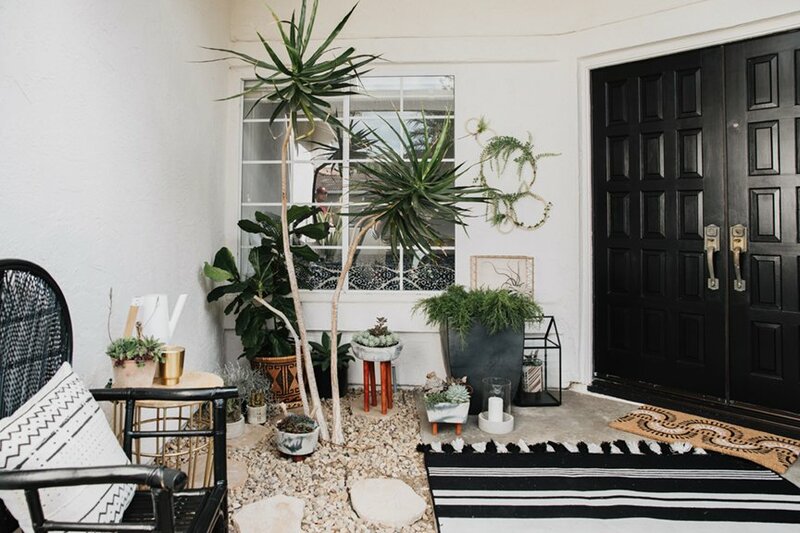 Rachael opts for a fiddle-leaf fig tree, heavenly bamboo, Sansevieria, jewel orchid, aloe, ivy, fiber-optic grass, asparagus fern and Syngonium podophyllum. While each of these is aesthetically different, the bones of a welcoming entry remain consistent—seating, lighting and plants. “Greenery helps to define the space and also functions as art,” Rachael says. 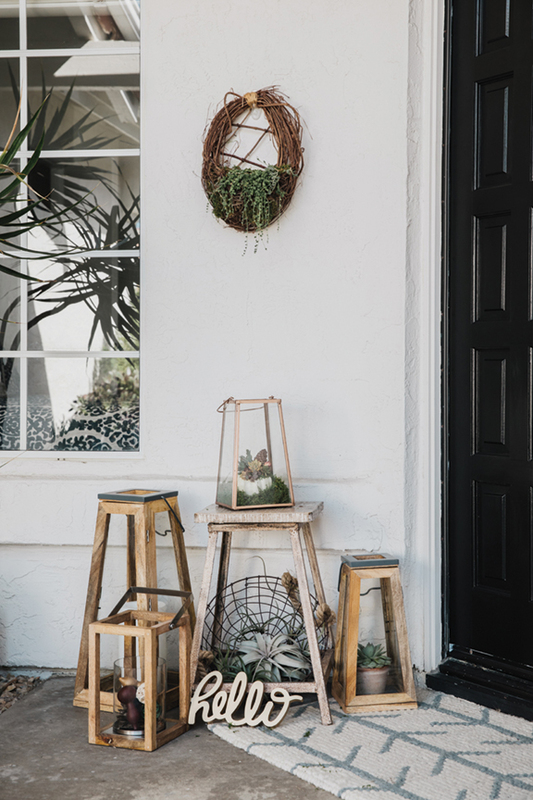 Bring the space just outside your front door to life with Rachael’s tips, plant suggestions and more to create an inviting bohemian, traditional or modern ambiance to the front of your house. Whatever your style, devote some time to plant selection. It’s not just about the amount of light the plant will or will not get to thrive. 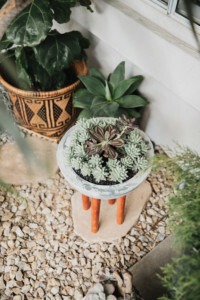 Rachael says you also need to consider its height, structure, how it might spill over the edge of a planter and whether or not it’s eye-catching enough to take the stage outside the front door. Rachael recommends selecting plants that complement your planters’ colors. 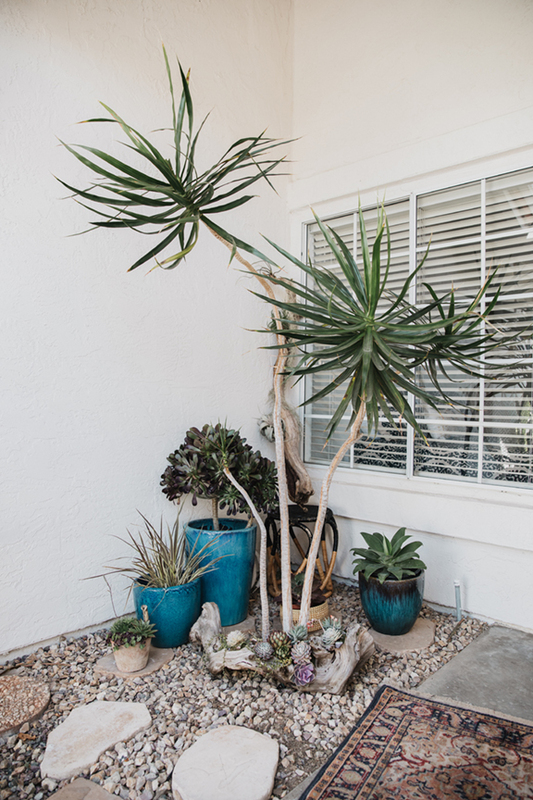 Find the right mix of textures and plant them in different ways to fill the entire space. 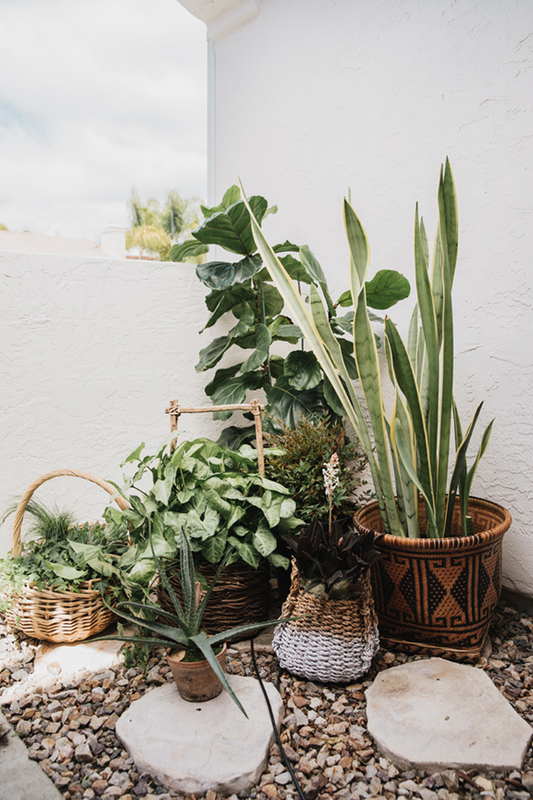 Rachael opts for a wide variety of plants in each of the vignettes, including grasses, ferns, succulents, aloes, pothos, fiddle-leaf fig trees, Sansevieria, ivies, junipers and more. “Greenery helps to define the space and also functions as art,” Rachael says. Plants with lots of texture such as foxtail agave, Cordyline ‘Electric Flash’, asparagus fern, cushion bush and cactus mingle in the mix. It’s all about layering when choosing a bohemian design. A wood chair or bench outfitted with a fluffy faux-fur throw pretty much sums up the bohemian approach, Rachael says. “This space is designed for someone who would enjoy their coffee outside barefoot,” she adds. Seating options include rattan chairs and a hammock. Underfoot, vintage rugs—which are more plush and not necessarily intended for outdoor use—intentionally overlap and appear almost scattered about. 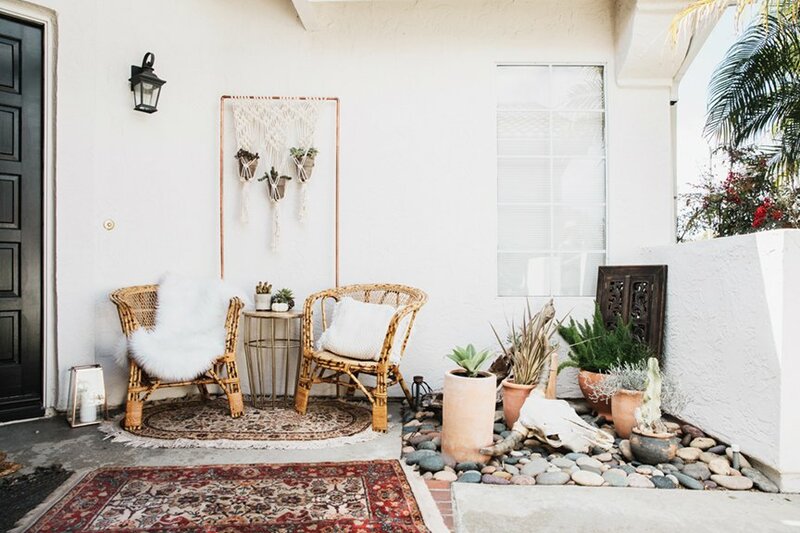 Rachael says she chose to forgo traditional indoor/outdoor rugs to give the area more color and an authentically weathered feel. 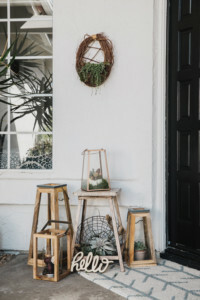 In this vignette, Rachael potted larger succulents and grasses in terra cotta pots, tucked air plants and succulents into pieces of driftwood, hung potted succulents in a macramé-and-copper fixture and used a variety of baskets to contain ferns, ivy, grasses, Sansevieria, pothos, and the fiddle-leaf fig. Woven chairs, copper piping, macramé, plush rugs and terra-cotta pots and bright blue containers warm up a courtyard painted black and white. Rachael potted larger succulents and grasses in terra-cotta pots, tucked air plants and succulents into pieces of driftwood. 1. These chairs and rugs came from Three Sparrows and are no longer available. Follow the shop @shopthreesparrows to see the latest offerings and find out which market you can visit to see the pieces in person. 2. This macramé fixture was custom-made for this shoot. 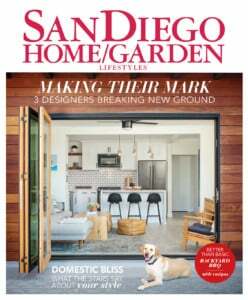 Check out all Macramama’s macramé hangers, accessories and swings, or pop into one of the San Diego boutiques that sell her creations. More info here. 3. These gorgeous terra-cotta pots come in lots of shapes and sizes—and are so reasonable. 4. Mix-and-match lanterns lend a collected vibe to the space. Tip: Pampas grass grows everywhere in San Diego and makes a sculptural arrangement with some nice height. Since it’s an invasive plant you wouldn’t want growing in your yard, Rachael advises foraging for fallen stems on the side of the road. Place them in a tall lantern, vase or basket on the porch. Though she was going for a more classic design, Rachael didn’t want to create an entry that in any way felt stuffy. Instead, she picked traditional chairs with a vintage-y feel and hints of plaid. 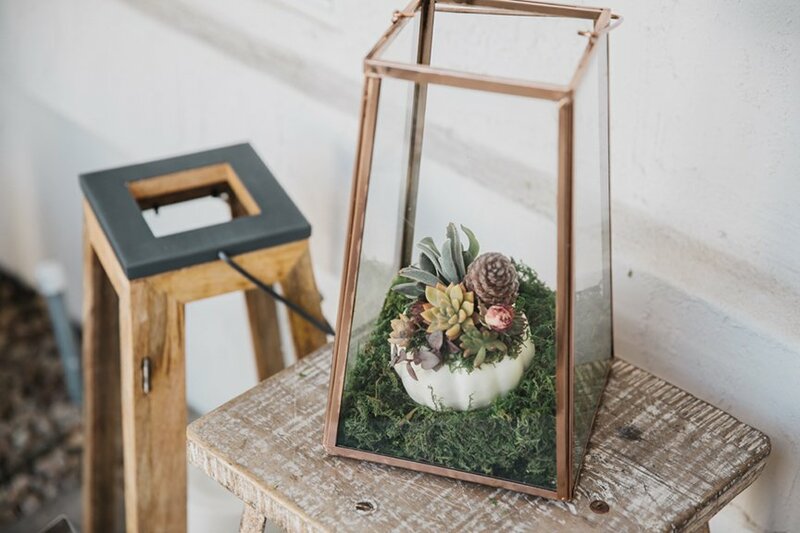 Rustic-looking lanterns and hurricane candle holders serve as terrariums for what could be a changing art installation. 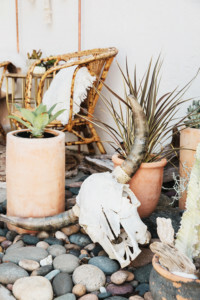 Here, Rachael styled the vessels to hold potted succulents, gourds, candles, artificial and dried plants, and air plants, but these items could easily be swapped for seasonal stems or other decor. In keeping with the not-everything-has-to-change philosophy, Rachael used the same plants but different containers. 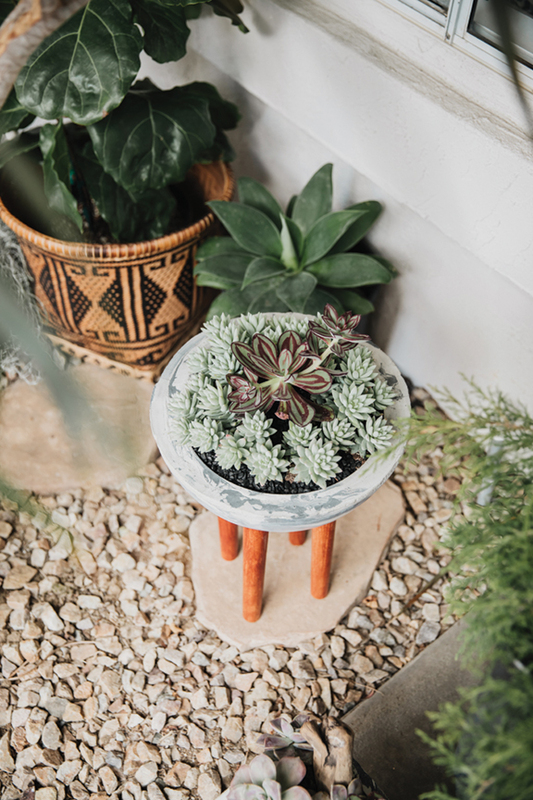 Glazed turquoise pots, wooden crates and some of the terra cotta planters hold the same succulents, grasses, ivy and ferns. 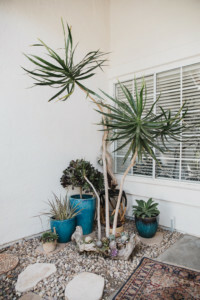 A vertical-growing juniper replaced the fiddle-leaf fig and more dried florals were added to the mix such as rose stems, eucalyptus branches and pinecones. 1. Vintage blankets and graphic door mats serve as rugs here. 2. Terra-cotta pots mingle with glazed turquoise containers. 3. Wooden lanterns add a rustic edge. Tip: Don’t frown on faux. Rachael uses dried eucalyptus generously. “I like that [the stems] keep a shape and a color, and you don’t have to maintain them to create a sense of life,” she says. To nail modern that’s not cold, start with something soft. Rachael let the black-and-white tasseled rug literally lay the foundation for this vignette. From there, she played with shapes: rectangular metal lanterns, stone pots with square openings, oval Acapulco chairs and wall art fashioned from circular embroidery hoops and artificial ferns. “Mid-century modern style is somehow both futuristic and retro,” Rachael says. So use geometry then soften the scene with lots of leafy greens in varying textures. 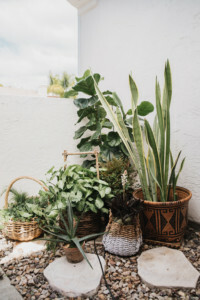 To warm up the monochromatic style, Rachael planted succulents, ferns, grasses, agaves and the fiddle-leaf fig in a mix of ceramic planters in wood stands; leggy, marbled concrete pots; terra cotta containers; and baskets. Driftwood sculptures and a longhorn skull lend a bit of rustic charm to the modern landscape as do the woven chair and throw pillow. 1. Acapulco chairs look sculptural but are really quite comfortable. Note: Folklore is a furniture rental company. You can also find Acapulco chairs online to buy with a simple search. 2. Concrete-and-wood containers make gorgeous vessels for succulents. Tip: Over one look? 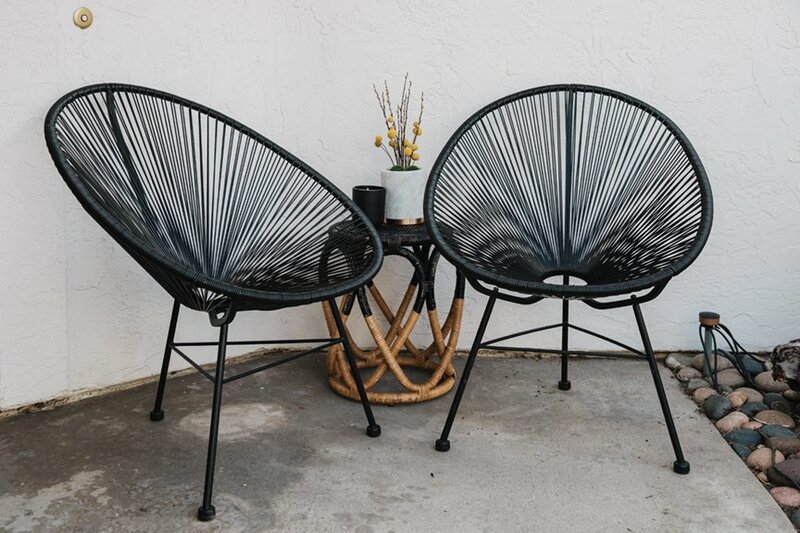 You don’t have to start from scratch if you choose timeless pieces and materials that work with a variety of styles such as wood seating, terra cotta planters and metal lanterns. “[From there,] you can mix and match in a lot of [trendier] elements,” Rachael explains.